Its January in the year 2013, dubbed to be the ‘unlucky’ year that could never live up to 2012. We’ve all eaten and drunk too much over the festive period, and as we look ahead to what 2013 has to offer we all decide we want to be a little bit skinnier along the way. Now I don’t want to be all doom and gloom. But I’m sure I’m not the only one living in a house of people who currently seem to have a million and one things to moan about, their waistlines being one. I should’ve known the joy and frivolity of Christmas wouldn’t last forever, but I didn’t expect it to end so soon! Nonetheless, requests are flying in for tasty food that will help people slim down over the coming months. After all, if there’s one thing we can change about this ‘unlucky’ year, it’s how much we weigh. 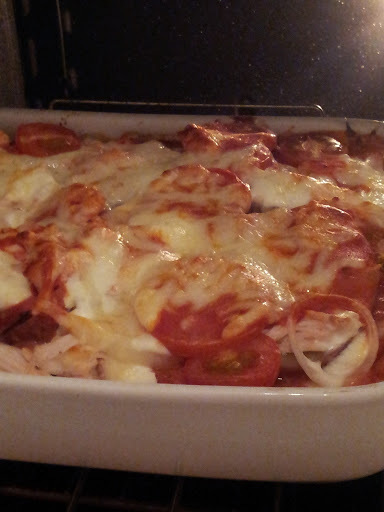 So, with weight loss in mind, and a fridge full of food I set about creating my low-fat creamy tomato potato bake. Now, the most common complaint about low fat food is that it is bland and doesn’t fill you up for long enough. This recipe is neither of those things! The reason behind this dish is that it always seems to me that as soon as I tell myself I should be eating healthily I suddenly crave all the things I shouldn’t, in particular chocolate and all things creamy. The indulgent creamy texture of the reduced fat crème fraiche in this sauce makes it feel like you’re treating yourself without taking on unnecessary calories. By making just a few substitutes on your ingredients list you can cut out quite a lot of fat! The fact that this dish is baked in the oven also reduced the need to add any fat to the cooking pan. (You won’t find any olive oil here!) You can further reduce the calories, and make it suitable for vegetarians, by simply leaving out the chicken. Start by slicing your potatoes until they are roughly ½ a centimetre thick. Place these into a pan of boiling water, and par boil for 5-10mins or until they have just started to soften. In the meantime, slice your onion and beef tomatoes thinly. Halve the cherry tomatoes and place to one side. In a mixing bowl, combine together the passata, crème fraiche, garlic (crushed) and herbs. Make sure this is thoroughly mixed so that the passata and crème fraiche have formed a creamy sauce. Once the potatoes have par boiled, take 1/3 of the potatoes and lay them across the base of an oven dish. Layer on top 1/3 of the tomatoes, onion and chicken. Pour over 1/3 of the sauce and repeat the process. 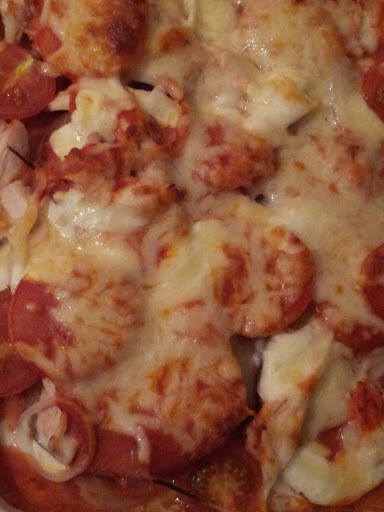 Once you have three layers of the potato/tomato/onion/sauce combination, top with a sprinkling of grated mozzarella. Place into a pre-heated oven at gas mark 5 for 50mins or until the dish is bubbling and cheese golden.